The Banking Summit - ‘Diamond and Jewellery Financing: Mitigating risks effectively’ - organized by India’s Gems and Jewellery Export Promotion Council (GJEPC) was held in Mumbai on May 11, 2018. The event, which was primarily envisaged to find ways to reduce risks and infuse confidence into financiers, was attended by leading banks and financial institutions including the SBI, Central Bank of India, IndusInd Bank, ECGC etc. Vice Chairman of GJEPC Colin Shah, who has been at the helm of drafting the white paper said, “The joint efforts of key financiers and industry have been able to address many risk factors and MYKYC will be a single largest contributor in increasing transparency and address relevant risks.” An MoU was also signed between the GJEPC and the AWDC for co-operation on the MyKYCBank platform. 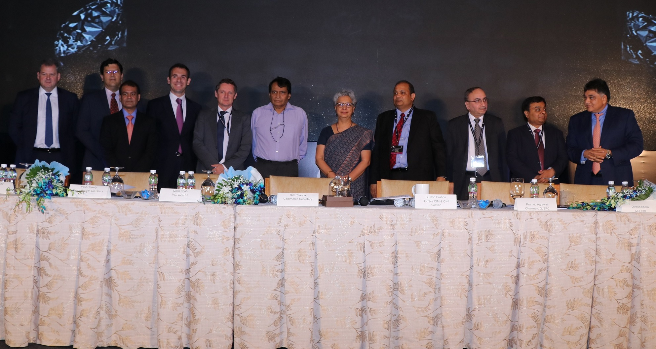 The summit was also attended by Paul Rowley, Executive Vice President, De Beers, Dinesh Kumar Khara, Managing Director, SBI, Manoj Dwivedi, Joint Secretary Ministry of Commerce and Industry, Biju Patnaik, Executive VP and Head, Diamond and Jewellery division IndusInd Bank, M. Senthilnathan, ED, ECGC, and others.